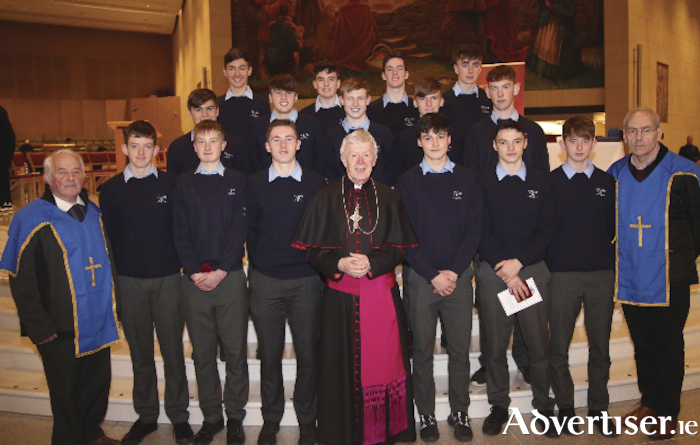 Students from St Gearld's College, Castlebar who were honoured at diocesan award ceremony in recognition of all their voluntary work carried out over the last twelve months. On Thursday last at our Lady’s Basilica, Knock, Archbishop Michael Neary gathered to celebrate and recognise the voluntary contribution of over 500 teenagers to their parish communities at the annual presentation of the Pope John Paul II Award. With over 1,200 people in attendance, Archbishop Michael welcomed the young people to the event, along with their families, friends, school teachers, principals, chaplains, priests and many representatives of the various parish and diocesan bodies. He offered a very heartfelt welcome to our very own sporting hero Cora Staunton, who came along to support and congratulate this impressive group of young people. Speaking to the young people receiving their award, Archbishop Michael said this is a wonderful celebration filled with music, dance, reflection and words of affirmation. "It is recognition of your dignity, the gifts that you have, the way in which you used them and is a pointer to your generosity of spirit. It is a very exciting and enjoyable time for you as you give expression to your youthful energy, and enthusiasm. Over the last year, the people whom you have encountered and helped have seen you as young people who are full of the joys of life, only too ready to help others. If you were not involved in this way then the lives of so many would be impoverished. As young people you are eager to strive for a better world. As a result of your experiences on this award programme, you have grown in your appreciation and understanding of Church. There is undoubtedly great idealism and generosity, but this needs to be challenged, and when challenged it thrives as we see in the Pope John Paul II awards. I commend you all on your achievement”. All 545 teenagers aged between 16 to 18 years of age, received their medal and certificate in recognition of so much work carried out by them in their school, parish and wider communities over the last year. They would have been involved in everything from publishing parish prayer books to teaching computers to the elderly, setting up a youth choir in their parish to caring for people with special needs on various pilgrimages to Lourdes over the year. Through their experiences on this award programme, they were given an opportunity to go beyond themselves and their needs, and reach out to others. The entire ceremony was youth led, with the 17 year old gold medal recipient Darragh Kennedy representing St. Colman’s College, Claremorris acting as the host for the evening.